Starting May 1, 2018, new changes will be in effect to make it easier for condo residents to charge their electric vehicles at home as part of Ontario's plan to fight climate change. Prevent condo boards from rejecting an owner's application to install an electric vehicle charging system on condo property when the owner meets certain conditions. By making it easier for drivers to switch to electric vehicles, Ontario is making it easier for people across the province to reduce greenhouse gas pollution. These new rules to facilitate the installation of electric vehicle charging systems in condos will remove barriers to condo residents who own electric vehicles, or are thinking about purchasing one, by enabling them charge their vehicles where they live. More than 680,000 people in Ontario live in condominiums and more than 50 per cent of new homes being built in the province are condominiums. Ontario’s Electric Vehicle Charging Incentive Program has provided incentives worth approximately $2.5 million for the installation of almost 3,000 home charging stations since January 2013. The Climate Change Action Plan and carbon market form the backbone of Ontario's strategy to cut greenhouse gas pollution to 15 per cent below 1990 levels by 2020, 37 per cent by 2030 and 80 per cent by 2050.The government will report on the plan's implementation annually and review the plan at least every five years. There are more than 18,500 electric vehicles currently on the road in Ontario. A shift to low- and zero-emission vehicles is vital to Ontario achieving its greenhouse gas reduction target of 80 per cent below 1990 levels by 2050. This document was published on April 23, 2018 and is provided for archival and research purposes. 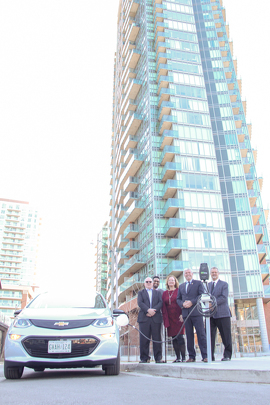 Minister MacCharles, along with MPP Arthur Potts, Assistant Deputy Minister, Glen Padassery, The Condominium Authority of Ontario (CAO) Chair, Tom Wright, The Condominium Management Regulatory Authority of Ontario (CMRAO) Chair, Aubrey LeBlanc with an electric vehicle and charging station. 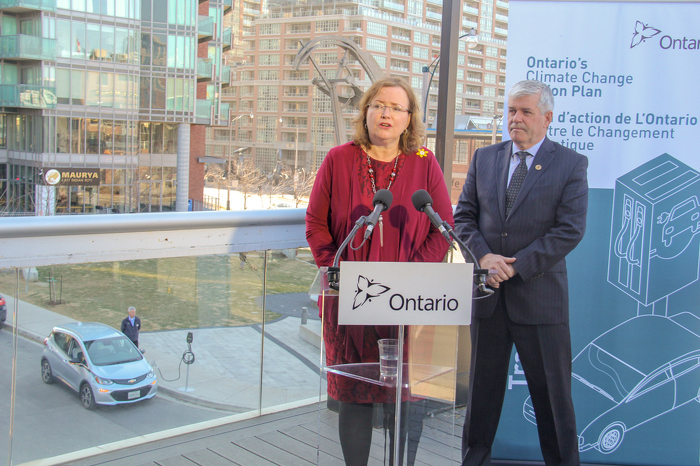 Minister MacCharles and MPP Arthur Potts announcing new laws to facilitate the installation of electric vehicle charging systems in condominiums.